Provest, &c. of King's College, Cambridge, Petition referred to Judges. It is Ordered, That the Consideration of the said Petition be, and is hereby, referred to the Lord Chief Justice of the Court of Common Pleas and Mr. Justice Denton; with the usual Directions, according to the Standing Orders. The House was moved, "That Leave may be given to withdraw the Appeal of James Lord Maitland and others; complaining of several Interlocutory Sentences of the Lords of Session in Scotland, whereunto Charles Earl of Lauderdale is Respondent." Ordered, That the Appellants have Leave to withdraw their Appeal accordingly. 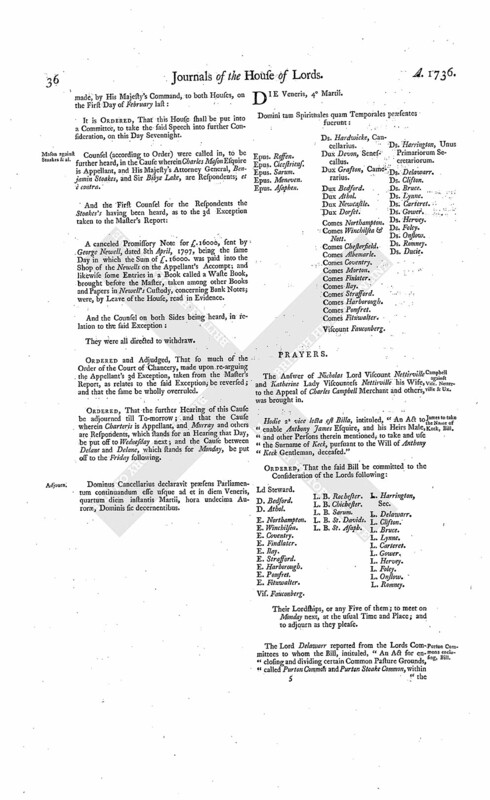 Hodie 1a vice lecta est Billa, intituled, "An Act to enable Trustees, during the respective Minorities of George Talbot Esquire and his Younger Brothers, to grant Leases of the Estates of the said Infants, in the Counties of Salop, Worcester, Berks, Chester, Oxford, and Wilts." Bailey peremptorily to answer Bennet's Appeal. The House was informed, "That John Bailey, Respondent to the Appeal of Hugh Bennet, had not put in his Answer to the said Appeal, though duly served with the Order of this House for that Purpose." Hodie 1a vice lecta est Billa, intituled, "An Act for Sale of certain Leasehold Estates of Thomas Cook Esquire, in the County of Glocester; and for settling some Freehold and Copyhold Estates of Inheritance, of greater Value, to the same Uses, in Lieu thereof." Mason against Stoakes & al. 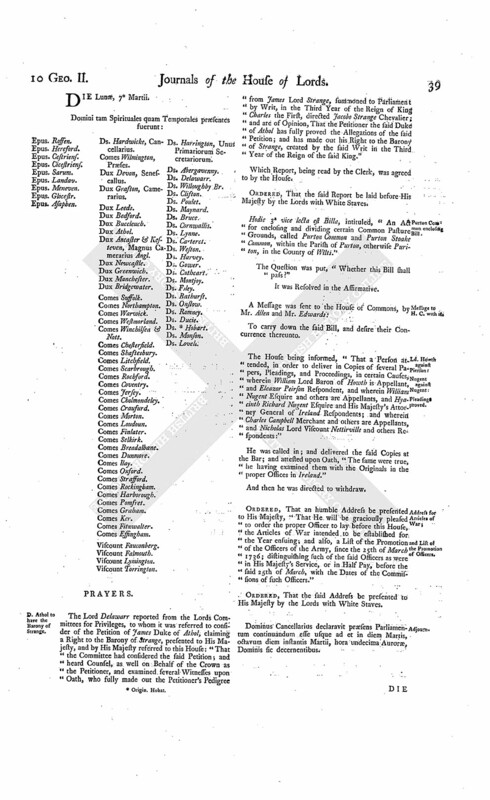 Counsel (according to Order) were called in, to be heard, upon the Petition and Appeal of Charles Mason Esquire; complaining of several Orders of the Court of Chancery, overruling Exceptions taken to the Report of the Master; to which Appeal His Majesty's Attorney General, Benjamin Stoakes, Executor of Joseph Newell deceased, and Sir Bibye Lake, are Respondents: As also upon a Cross Appeal of the said Respondents. Ordered and Adjudged, That so much of the Order of the said Court, complained of in the said Appeal, whereby the said Exception is overruled, be affirmed. Then the Counsel were a Second Time called in, and heard, on both Sides, as to the 2d and 16th Exceptions, and the Respondent Newell's 1st Exception. And then they were again directed to withdraw. Ordered and Adjudged, That the said Mason, and the said Benjamin Stoakes, Executor of Joseph Newell deceased, do proceed to a Trial at Law, in the Court of King's Bench, on this Issue; (videlicet,) "Whether the 160 Malt Tickets in the same Exception mentioned, amounting to £1600, and the Note for £750, given by the said Mason to the said Joseph Newell, dated the 14th Day of December 1706, or either or which of them, was the Consideration or Deposit, or Part of the Consideration or Deposit, for the said George and Joseph Newell's advancing the Three Cash Notes, amounting to £2350, in the said Mason's 2d Exception mentioned; or whether there was any other, and what, Consideration or Deposit for the same; and that the Court of Chancery do give all proper Directions for framing the Issue, and proceeding to Trial thereupon; and that the Matter of both the last mentioned Exceptions, and all further Directions thereupon, be reserved for the Consideration of the said Court, till after the said Trial had." Ordered, That the further Hearing of the said Cause be adjourned till To-morrow. Dominus Cancellarius declaravit præsens Parliamentum continuandum esse usque ad et in diem Jovis, tertium diem instantis Martii, hora undecima Auroræ, Dominis sic decernentibus. Hodie 1a vice lecta est Billa, intituled, "An Act to enable James Viscount Limerick in the Kingdom of Ireland to grant such Building Leases as are therein mentioned, of Part of his Estate in Dundalk, in the County of Louth, in the said Kingdom." Ordered, That the said Bill be read a Second Time on Tuesday next; and the Lords to be summoned. Hodie 2a vice lecta est Billa, intituled, "An Act to enable Trustees, during the respective Minorities of George Talbot Esquire and his Younger Brothers, to grant Leases of the Estates of the said Infants, in the Counties of Salop, Worcester, Berks, Chester, Oxford, and Wilts." Ld. Vis. Fauconberg. L. B. Rochester. L. B. St. Asaph. L. Abergavenny. Their Lordships, or any Five of them; to meet on Friday the 18th Instant, at the usual Time and Place; and to adjourn as they please. Hodie 2a vice lecta est Billa, intituled, "An Act for Sale of certain Leasehold Estates of Thomas Cook Esquire, in the County of Glocester; and for settling some Freehold and Copyhold Estates of Inheritance, of greater Value, to the same Uses, in Lieu thereof." James to take the Name of Keck, Bill. With a Bill, intituled, "An Act to enable Anthony James Esquire, and his Heirs Male, and other Persons therein mentioned, to take and use the Surname of Keck, pursuant to the Will of Anthony Keck Gentleman, deceased;" to which they desire the Concurrence of this House. Ordered, That the said Bill be read a Second Time on Wednesday next. Carmichael to enter into Recognizance for Hepburne. The House being moved, "That James Carmichael Esquire may be permitted to enter into a Recognizance for James Hepburne, on account of his Appeal depending in this House; he residing in Scotland:"
It is Ordered, That the said James Carmichael Esquire may enter into a Recognizance for the Appellant, as desired. Legh's Petition referred to Judges. Proceedings touching the Murder of Capt. Porteous, delivered. 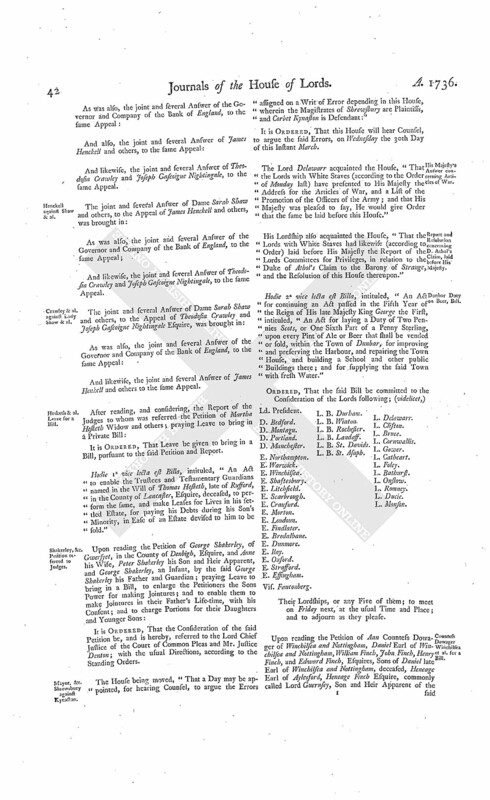 The Duke of Newcastle (by His Majesty's Command) presented to the House, pursuant to their Lordships Address to His Majesty of the 10th of February last, several Papers. 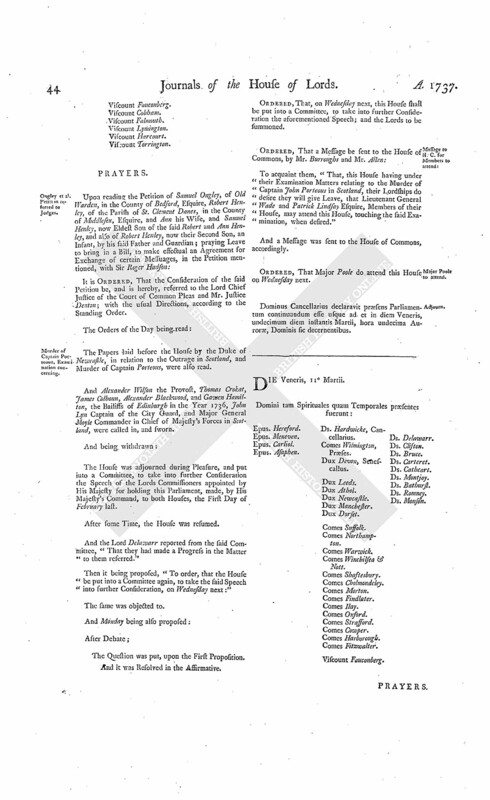 "Copy of the Petition of John Porteous." "Copy of John Porteous's Reprieve, August 26th, 1736." "Copy of a Petition in Favour of John Porteous." "Copy of a Petition of John Porteous." "Copy of a Letter from the Lord Justice Clerk, to the Duke of Newcastle, Edinburgh, September 4th, 1736." 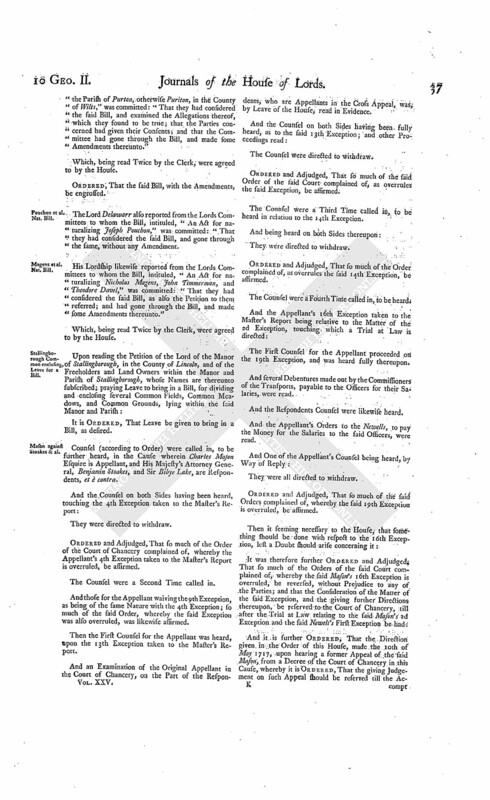 "Copy of the Narrative of the Tumult at Edinburgh, September 7th, 1736." "Copy of a Letter from the Duke of Newcastle, to the Lord Justice Clerk, September 12th, 1736." "Copy of a Letter from the Duke of Newcastle, to Major General Moyle, September 12th, 1736." "Copy of a Letter from Major General Moyle, to the Duke of Newcastle, Edinburgh, September 9th, 1736." "Copy of a Letter from the Duke of Newcastle, to the Lord Justice Clerk, September, 17th, 1736." "Copy of a Letter from the Duke of Newcastle, to the Lord Provost of Edinburgh, September 17th, 1736." "Copy of a Letter from the Duke of Newcastle, to the Lord Advocate of Scotland, September 17th, 1736." "Copy of a Letter from the Duke of Newcastle, to the Solicitor General of Scotland, September 17th, 1736." "Copy of a Letter from the Duke of Newcastle, to the Commander in Chief of the Forces in Scotland, September 17th, 1736." "Copy of a Letter from the Duke of Newcastle, to the Governor of the Castle at Edinburgh, September 17th, 1736." "Copy of a Letter from the Duke of Newcastle, to Lieutenant General Wade, September 17th, 1736." "Copy of a Letter from the Duke of Newcastle, to Major General Moyle, September 17th, 1736." "Copy of a Letter from the Lord Justice Clerk, to the Duke of Newcastle, Edinburgh, September 16th, 1736." "Copy of a Letter from Major General Moyle, to the Duke of Newcastle, Edinburgh, September 18th, 1736." "Extract of a Letter from the Lord Justice Clerk, to the Duke of Newcastle, Edinburgh, September 23d, 1736." "Copy of a Proclamation for discovering, apprehending, and bringing to Justice, the Persons concerned in the barbarous Murder of Captain Porteous." "Copy of a Letter from the Lord Provost of Edinburgh, to the Duke of Newcastle, Edinburgh, September 22d, 1736." "Copy of a Letter from the Solicitor General of Scotland, to the Duke of Newcastle, Edinburgh, September 25th, 1736." "Copy of a Letter from Major General Moyle, to the Duke of Newcastle, Edinburgh, September 23d, 1736." "Copy of a Letter from Major General Moyle, to the Duke of Newcastle, Edinburgh, September 28th, 1736." "Copy of a Letter from the Solicitor General of Scotland, to the Duke of Newcastle, Edinburgh, September 30th, 1736." "Copy of a Letter from the Lord Advocate of Scotland, to the Duke of Newcastle, Culloden, near Inverness, October 1st, 1736." "Copy of a Letter from the Solicitor General of Scotland, to the Duke of Newcastle, Edinburgh, October 9th, 1736." "Copy of the Order of the Magistrates of Edinburgh, October 20th, 1736." 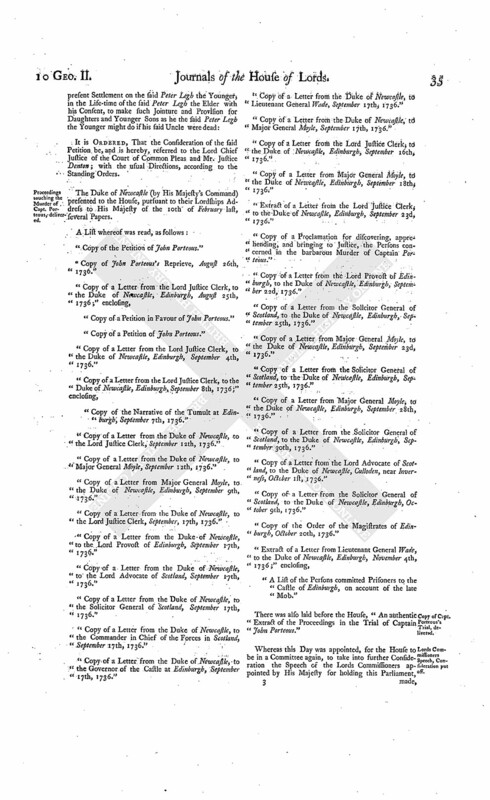 "A List of the Persons committed Prisoners to the Castle of Edinburgh, on account of the late Mob." Copy of Capt. Porteous's Trial, delivered. There was also laid before the House, "An authentic Extract of the Proceedings in the Trial of Captain John Porteous." Lords Commissioners Speech, Consideration put off. It is Ordered, That this House shall be put into a Committee, to take the said Speech into further Consideration, on this Day Sevennight. Counsel (according to Order) were called in, to be further heard, in the Cause wherein Charles Mason Esquire is Appellant, and His Majesty's Attorney General, Benjamin Stoakes, and Sir Bibye Lake, are Respondents; et è contra. A canceled Promissory Note for £16000, sent by George Newell, dated 8th April, 1707, being the same Day in which the Sum of £16000. was paid into the Shop of the Newells on the Appellant's Accompt; and likewise some Entries in a Book called a Waste Book, brought before the Master, taken among other Books and Papers in Newell's Custody, concerning Bank Notes; were, by Leave of the House, read in Evidence. They were all directed to withdraw. Ordered and Adjudged, That so much of the Order of the Court of Chancery, made upon re-arguing the Appellant's 3d Exception, taken from the Master's Report, as relates to the said Exception, be reversed; and that the same be wholly overruled. Ordered, That the further Hearing of this Cause be adjourned till To-morrow; and that the Cause wherein Charteris is Appellant, and Murray and others are Respondents, which stands for an Hearing that Day, be put off to Wednesday next; and the Cause between Delane and Delane, which stands for Monday, be put off to the Friday following. Dominus Cancellarius declaravit præsens Parliamentum continuandum esse usque ad et in diem Veneris, quartum diem instantis Martii, hora undecima Auroræ, Dominis sic decernentibus. Viscount Fauconberg. Ds. Harrington, Unus Primariorum Secretariorum. Campbell against Vise. Netterville & Ux. The Answer of Nicholas Lord Viscount Nettirville and Katherine Lady Viscounts Nettirville his Wife, to the Appeal of Charles Campbell Merchant and others, was brought in. Hodie 2a vice lecta est Billa, intituled, "An Act to enable Anthony James Esquire, and his Heirs Male, and other Persons therein mentioned, to take and use the Surname of Keck, pursuant to the Will of Anthony Keck Gentleman, deceased." Vis. Fauconberg. L. B. Rochester. L. B. St. Asaph. L. Harrington, Sec. 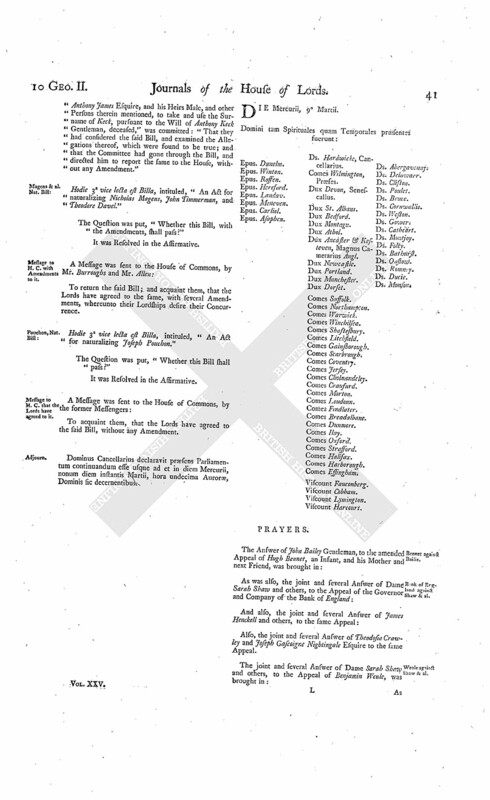 The Lord Delawarr reported from the Lords Committees to whom the Bill, intituled, "An Act for enclosing and dividing certain Common Pasture Grounds, called Purton Common and Purton Stoake Common, within the Parish of Purton, otherwise Puriton, in the County of Wilts," was committed: "That they had considered the said Bill, and examined the Allegations thereof, which they found to be true; that the Parties concerned had given their Consents; and that the Committee had gone through the Bill, and made some Amendments thereunto." Pouchon et al. Nat. Bill. The Lord Delawarr also reported from the Lords Committees to whom the Bill, intituled, "An Act for naturalizing Joseph Pouchon," was committed: "That they had considered the said Bill, and gone through the same, without any Amendment. Magens et al. Nat. Bill. His Lordship likewise reported from the Lords Committees to whom the Bill, intituled, "An Act for naturalizing Nicholas Magens, John Timmerman, and Theodore Davel," was committed: "That they had considered the said Bill, as also the Petition to them referred; and had gone through the Bill, and made some Amendments thereunto." Stallingborough Common enclosing, Leave for a Bill. Counsel (according to Order) were called in, to be further heard, in the Cause wherein Charles Mason Esquire is Appellant, and His Majesty's Attorney General, Benjamin Stoakes, and Sir Bibye Lake, are Respondents, et è contra. Ordered and Adjudged, That so much of the Order of the Court of Chancery complained of, whereby the Appellant's 4th Exception taken to the Master's Report is overruled, be affirmed. The Counsel were a Second Time called in. And those for the Appellant waiving the 9th Exception, as being of the same Nature with the 4th Exception; so much of the said Order, whereby the said Exception was also overruled, was likewise affirmed. Then the First Counsel for the Appellant was heard, upon the 13th Exception taken to the Master's Report. And an Examination of the Original Appellant in the Court of Chancery, on the Part of the Respondents, who are Appellants in the Cross Appeal, was; by Leave of the House, read in Evidence. Ordered and Adjudged, That so much of the said Order of the said Court complained of, as overrules the said Exception, be affirmed. The Counsel were a Third Time called in, to be heard in relation to the 14th Exception. Ordered and Adjudged, That so much of the Order complained of, as overrules the said 14th Exception, be affirmed. The Counsel were a Fourth Time called in, to be heard. The First Counsel for the Appellant proceeded on the 19th Exception, and was heard fully thereupon. And several Debentures made out by the Commissioners of the Transports, payable to the Officers for their Salaries, were read. And the Respondents Counsel were likewise heard. And the Appellant's Orders to the Newells, to pay the Money for the Salaries to the said Officers, were read. Ordered and Adjudged, That so much of the said Orders complained of, whereby the said 19th Exception is overruled, be affirmed. 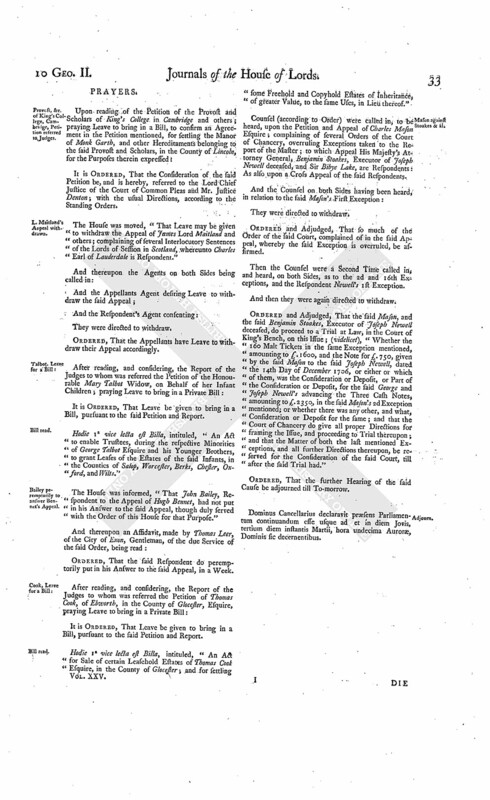 And it is further Ordered, That the Direction given in the Order of this House, made the 10th of May 1717, upon hearing a former Appeal of the said Mason, from a Decree of the Court of Chancery in this Cause, whereby it is Ordered, That the giving Judgement on such Appeal should be reserved till the Ac compt between the said Mason and the Newells be finished, as directed by the said Order, be continued. "After hearing Counsel, as well on Wednesday last, as Yesterday and this Day, upon the amended Petition and Appeal of Charles Mason Esquire; complaining of so much of an Order of the Court of Chancery, made the 15th of January 1733, as overrules the Appellant's 2d, 13th, 14th, and 16th Exceptions to the Master's Report; as also of so much of the said Order, and also of an Order of the same Court, made the 16th of January 1734, as overrules the Appellant's First Exception; and also his Third Exception, save only as to the Sum of One Thousand Six Hundred Seventy-six Pounds, Ten Shillings, and Five Pence; and that Part of the Appellant's 4th Exception, relating to a Note of One Thousand Pounds to one Gerard, in the Appeal mentioned; and so much of the Appellant's 9th Exception, as relates to a Note payable to George Newell deceased, or Order, dated the 2d of April 1707, for the Sum of Eight Hundred and Seventy Pounds; and also the Appellant's 19th Exception; which said Orders were made on arguing and re-arguing Exceptions taken to the Master's Report, in a Cause wherein the Appellant was Plaintiff, and George Newell lately deceased, Joseph Newell, His Majesty's Attorney General, and others, were Defendants; and in another Cause, wherein Sir Biby Lake Baronet was Plaintiff, and the Appellant, the said George Newell lately deceased, Joseph Newell, and others, were Defendants; and praying, "That the said Orders may be reversed; and that this House will give the Appellant such Relief, as to their Lordships shall seem meet:" As also upon the several Answers of John Wills Esquire, His Majesty's then Attorney General, on Behalf of His Majesty, Benjamin Stoakes, Executor of the said Joseph Newell deceased, and the said Sir Biby Lake, put in to the said Appeal: And likewise upon a Cross Appeal of His Majesty's said Attorney General and the said Benjamin Stoakes; complaining of so much of the said Order of the 15th of January 1733, whereby the said Joseph Newell's First Exception was overruled; and also of the said Order of the 16th of January 1734, allowing the Appellant Mason's 3d Exception, as to the Sum of One Thousand Six Hundred Seventy-six Pounds, Ten Shillings, and Five Pence; and praying, "That the said Orders may be reversed; and that such Relief may be given to the said Appellants in the Cross Appeal as to this House shall seem meet:" As also upon the several Answers of the said Charles Mason and Sir Biby Lake put in to the said Cross Appeal; and due Consideration had of what was offered on all Sides in these Causes: It is Ordered and Adjudged, by the Lords Spiritual and Temporal in Parliament assembled, That so much of the Orders of the Court of Chancery complained of, whereby the said Mason's 1st, 13th, 14th, and 19th Exceptions, and Part of the said Mason's 4th and 9th Exceptions were overruled, be, and the same is hereby, affirmed; but that so much of the Orders of the said Court complained of, whereby the said Mason's 2d Exception and the said Joseph Newell's First Exception were overruled, be reversed: And it is, on the said Two Exceptions last mentioned, further Ordered, That the said Appellant Mason, and the said Benjamin Stoakes, Executor of Joseph Newell deceased, do proceed to a Trial at Law in the Court of King's Bench, on this Issue; (videlicet,) "Whether the One Hundred and Sixty Malt Tickets, in the same Exceptions mentioned, amounting to One Thousand Six Hundred Pounds, and the Note for Seven Hundred and Fifty Pounds, given by the said Mason to the said Joseph Newell, dated the 14th Day of December 1706, or either and which of them, were the Consideration or Deposit, or Part of the Consideration or Deposit, for the said George and Joseph Newells advancing the Three Cash Notes, amounting to Two Thousand Three Hundred and Fifty Pounds, in the said Mason's 2d Exception mentioned; or whether there was any other, and what, Consideration or Deposit for the same;" and that the Court of Chancery do give all proper Directions for framing the said Issue, and proceeding to Trial thereupon; and that the Matter of both the last mentioned Exceptions, and all further Directions thereupon be reserved for the Consideration of the Court of Chancery, till after the said Trial had: And it is further Ordered and Adjudged, That so much of the Order of the said Court, of the 16th of January 1734, as relates to the said Mason's 3d Exception, be reversed; and that the said 3d Exception be wholly overruled; and that so much of the Orders complained of, whereby the said Mason's 16th Exception is overruled, be reversed, without Prejudice to any of the Parties; and that the Consideration of the Matter of the said Exception, and the giving further Directions thereupon, be reversed to the Court of Chancery, till after the said Trial at Law relating to the said Mason's 2d Exception and the said Newell's First Exception be had: And it is further Ordered, That the Direction given in the Order of this House, made the 10th of May 1717, upon hearing a former Appeal of the said Charles Mason, from a Decree of the Court of Chancery in this Cause, whereby it is ordered, That the giving Judgement on such Appeal should be reserved till the Accompt between the said Mason and the said George and Joseph Newell should be finished, as directed by the said Court, be continued." Dominus Cancellarius declaravit præsens Parliamentum continuandum esse usque ad et in diem Lunæ, septimum diem instantis Martii, hora undecima Auroræ, Dominis sic decernentibus. D. Athol to have the Barony of Strange. The Lord Delawarr reported from the Lords Committees for Privileges, to whom it was referred to consider of the Petition of James Duke of Athol, claiming a Right to the Barony of Strange, presented to His Majesty, and by His Majesty referred to this House: "That the Committee had considered the said Petition; and heard Counsel, as well on Behalf of the Crown as the Petitioner, and examined several Witnesses upon Oath, who fully made out the Petitioner's Pedigree from James Lord Strange, summoned to Parliament by Writ, in the Third Year of the Reign of King Charles the First, directed Jacobo Strange Chevalier; and are of Opinion, That the Petitioner the said Duke of Athol has fully proved the Allegations of the said Petition; and has made out his Right to the Barony of Strange, created by the said Writ in the Third Year of the Reign of the said King." Which Report, being read by the Clerk, was agreed to by the House. Ordered, That the said Report be laid before His Majesty by the Lords with White Staves. Hodie 3a vice lecta est Billa, intituled, "An Act for enclosing and dividing certain Common Pasture Grounds, called Purton Common and Purton Stoake Common, within the Parish of Purton, otherwise Puriton, in the County of Wilts." 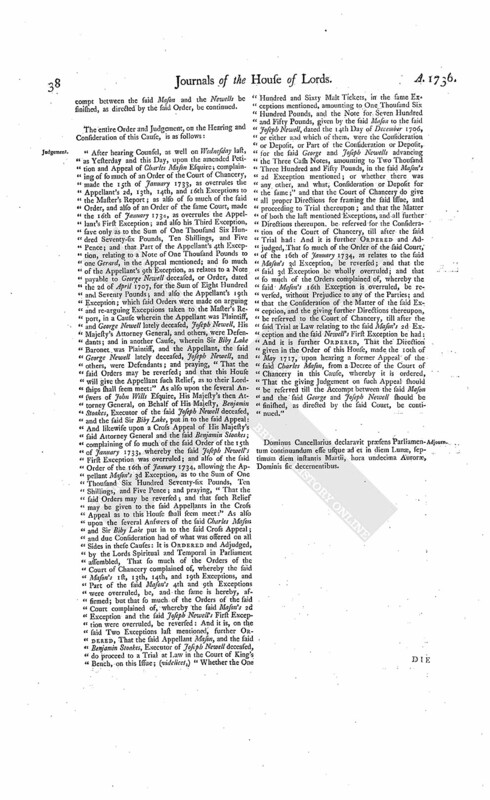 The House being informed, "That a Person attended, in order to deliver in Copies of several Papers, Pleadings, and Proceedings, in certain Causes, wherein William Lord Baron of Howth is Appellant, and Eleazor Peirson Respondent, and wherein William Nugent Esquire and others are Appellants, and Hyacinth Richard Nugent Esquire and His Majesty's Attorney General of Ireland Respondents; and wherein Charles Campbell Merchant and others are Appellants, and Nicholas Lord Viscount Nettirville and others Respondents:"
He was called in; and delivered the said Copies at the Bar; and attested upon Oath, "The same were true, he having examined them with the Originals in the proper Offices in Ireland." and List of the Promotion of Officers. Ordered, That an humble Address be presented to His Majesty, "That He will be graciously pleased to order the proper Officer to lay before this House, the Articles of War intended to be established for the Year ensuing; and also, a List of the Promotion of the Officers of the Army, since the 25th of March 1736; distinguishing such of the said Officers as were in His Majesty's Service, or in Half Pay, before the said 25th of March, with the Dates of the Commissions of such Officers." Dominus Cancellarius declaravit præsens Parliamentum continuandum esse usque ad et in diem Martis, octavum diem instantis Martii, hora undecima Auroræ, Dominis sic decernentibus. Bank of England against Morice et al. Weale et al. against Morice et al. Crawley against Morice & al. The Answer of the said Catherine Morice, to the Appeal of James Henckell and others, was brought in. As was also, the joint and several Answer of the said Anne Morice and others, to the same Appeal. Medley et a against Stoakes, in Error. The Lord Chancellor, as Lord Chief Justice of the Court of King's Bench, delivered in a Writ of Error, returnable into this House from the said Court, wherein John Medley and others are Plaintiffs, and Humphrey Stoacks is Defendant. The House being informed, "That a Person from the Admiralty-office attended:"
"A Report of the Commissioners of Greenwich Hospital, what Money has been received from the Derwentwater Estate in the Year 1736; and of their Proceedings in carrying on the Building." Dunbar, Duty on Beer, Bill. With a Bill, intituled, "An Act for continuing an Act passed in the Fifth Year of the Reign of His late Majesty King George the First, intituled, "An Act for laying a Duty of Two Pennies Scots, or One Sixth Part of a Penny Sterling, upon every Pint of Ale or Beer that shall be vended or sold within the Town of Dunbar, for improving and preserving the Harbour, and repairing the Town House, and building a School and other public Buildings there, and for supplying the said Town with fresh Water;" to which they desire the Concurrence of this House. 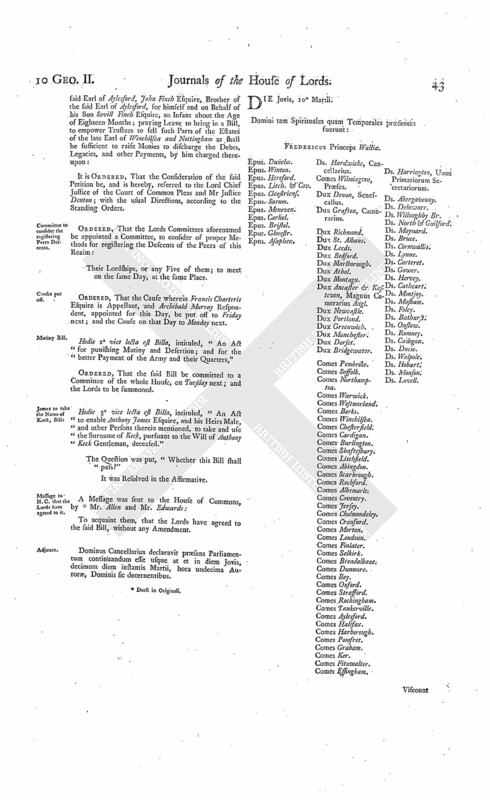 Whereas this Day was appointed, for the Second Reading of the Bill, intituled, "An Act to enable James Viscount Limerick, in the Kingdom of Ireland, to grant such Building Leases as are therein mentioned, of Part of his Estate in Dundalk, in the County of Louth, in the said Kingdom:"
It is Ordered, That the said Bill be read a Second Time on Tuesday the Third Day of May next. O'Farrell against Jessop & al. The House being informed, "That Mr. Brereton attended, in order to deliver in Copies of several Papers, Pleadings, and Proceedings, in the Cause wherein Roger O'Farrell Gentleman is Appellant, and Robert Jessop and others are Respondents:"
He was thereupon called in; and delivered, at the Bar, the said Copies; and attested upon Oath, "The same were true, he having examined them with the Originals in the proper Office in Ireland." The Lord Delawarr reported from the Lords Committees to whom the Bill, intituled, "An Act to enable Anthony James Esquire, and his Heirs Male, and other Persons therein mentioned, to take and use the Surname of Keck, pursuant to the Will of Anthony Keck Gentleman, deceased," was committed: "That they had considered the said Bill, and examined the Allegations thereof, which were found to be true; and that the Committee had gone through the Bill, and directed him to report the same to the House, without any Amendment." Hodie 3a vice lecta est Billa, intituled, "An Act for naturalizing Nicholas Magens, John Timmerman, and Theodore Davel." To return the said Bill; and acquaint them, that the Lords have agreed to the same, with several Amendments, whereunto their Lordships desire their Concurrence. Hodie 3a vice lecta est Billa, intituled, "An Act for naturalizing Joseph Pouchon." Dominus Cancellarius declaravit præsens Parliamentum continuandum esse usque ad et in diem Mercurii, nonum diem instantis Martii, hora undecima Auroræ, Dominis sic decernentibus. Bank of England against Shaw & al. Also, the joint and several Answer of Theodosia Crawley and Joseph Gascoigne Nightingale Esquire to the same Appeal. Weale against Shaw & al. And likewise, the joint and several Answer of Theodosia Crawley and Joseph Gascoigne Nightingale, to the same Appeal. Henckell against Shaw & al. And likewise, the joint and several Answer of Theodosia Crawley and Joseph Gascogine Nightingale, to the same Appeal. Crawley & al. against Lady Shaw & al. And likewise, the joint and several Answer of James Henkell and others to the same Appeal. Hesketh & al. Leave for a Bill. Hodie 1a vice lecta est Billa, intituled, "An Act to enable the Trustees and Testamentary Guardians named in the Will of Thomas Hesketh, late of Rufford, in the County of Lancaster, Esquire, deceased, to perform the same, and make Leases for Lives in his settled Estate, for paying his Debts during his Son's Minority, in Ease of an Estate devised to him to be sold." Shakerley, &c. Petition referred to Judges. Mayor, &c. Shrewsbury against Kynaston. The House being moved, "That a Day may be appointed, for hearing Counsel, to argue the Errors assigned on a Writ of Error depending in this House, wherein the Magistrates of Shrewsbury are Plaintiffs, and Corbet Kynaston is Defendant:"
It is Ordered, That this House will hear Counsel, to argue the said Errors, on Wednesday the 30th Day of this Instant March. His Majesty's Answer concerning Articles of War. The Lord Delawarr acquainted the House, "That the Lords with White Staves (according to the Order of Monday last) have presented to His Majesty the Address for the Articles of War, and a List of the Promotion of the Officers of the Army; and that His Majesty was pleased to say, He would give Order that the same be laid before this House." 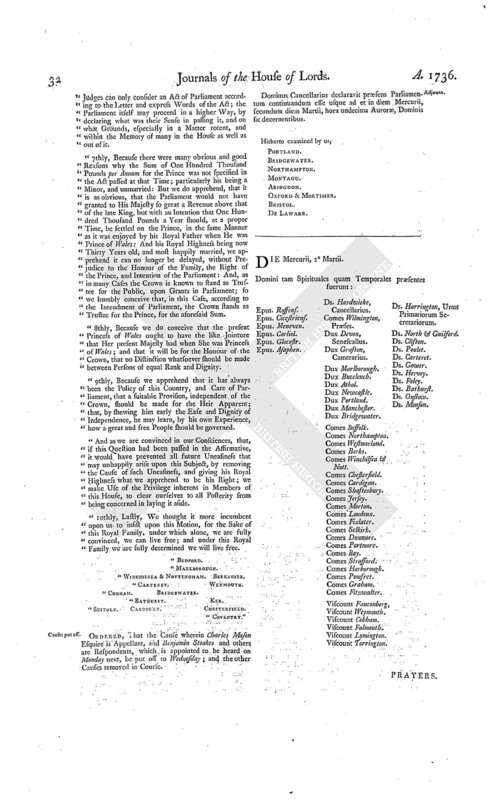 Report and Resolution concerning D. Athol's Claim, laid before His Majesty. 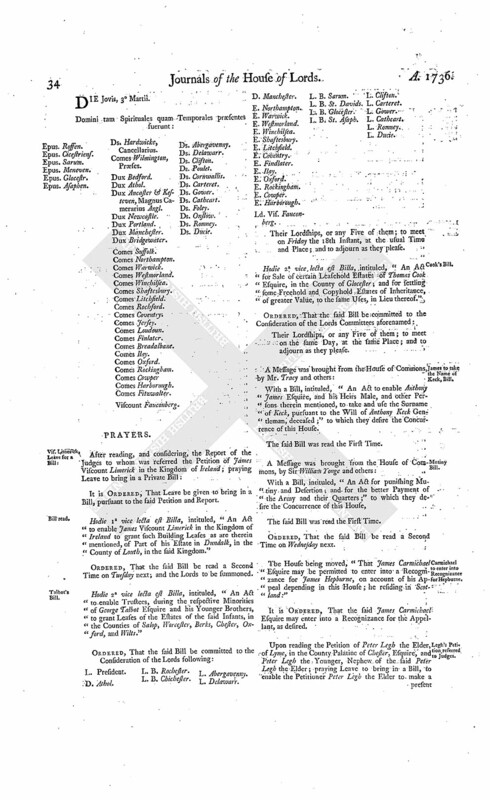 His Lordship also acquainted the House, "That the Lords with White Staves had likewise (according to Order) laid before His Majesty the Report of the Lords Committees for Privileges, in relation to the Duke of Athol's Claim to the Barony of Strange, and the Resolution of this House thereupon." Dunbar Duty on Beer, Bill. Hodie 2a vice lecta est Billa, intituled, "An Act for continuing an Act passed in the Fifth Year of the Reign of His late Majesty King George the First, intituled, "An Act for laying a Duty of Two Pennies Scots, or One Sixth Part of a Penny Sterling, upon every Pint of Ale or Beer that shall be vended or sold, within the Town of Dunbar, for improving and preserving the Harbour, and repairing the Town House, and building a School and other public Buildings there; and for supplying the said Town with fresh Water." L. B. St. Asaph. L. Delawarr. Countess Dowager Winchilsea et al. for a Bill. It is Ordered, That the Consideration of the said Petition be, and is hereby, referred to the Lord Chief Justice of the Court of Common Pleas and Mr Justice Denton; with the usual Directions, according to the Standing Orders. Committee to consider the registering Peers Descents. Their Lordships, or any Five of them; to meet on the same Day, at the same Place. Ordered, That the Cause wherein Francis Charteris Esquire is Appellant, and Archibald Murray Respondent, appointed for this Day, be put off to Friday next; and the Cause on that Day to Monday next. Hodie 2a vice lecta est Billa, intituled, "An Act for punishing Mutiny and Desertion; and for the better Payment of the Army and their Quarters,"
Ordered, That the said Bill be committed to a Committee of the whole House, on Tuesday next; and the Lords to be summoned. Hodie 3a vice lecta est Billa, intituled, "An Act to enable Anthony James Esquire, and his Heirs Male, and other Persons therein mentioned, to take and use the Surname of Keck, pursuant to the Will of Anthony Keck Gentleman, deceased." To acquiant them, that the Lords have agreed to the said Bill, without any Amendment. Dominus Cancellarius declaravit præsens Parliamentum continuandum esse usque at et in diem Jovis, decimum diem instantis Martii, hora undecima Auroræ, Dominis sic decernentibus. Ongley et al. Petition referred to Judges. It is Ordered, That the Consideration of the said Petition be, and is hereby, referred to the Lord Chief Justice of the Court of Common Pleas and Mr. Justice Denton; with the usual Directions, according to the Standing Order. Murder of Captain Porteous, Examination concerning. 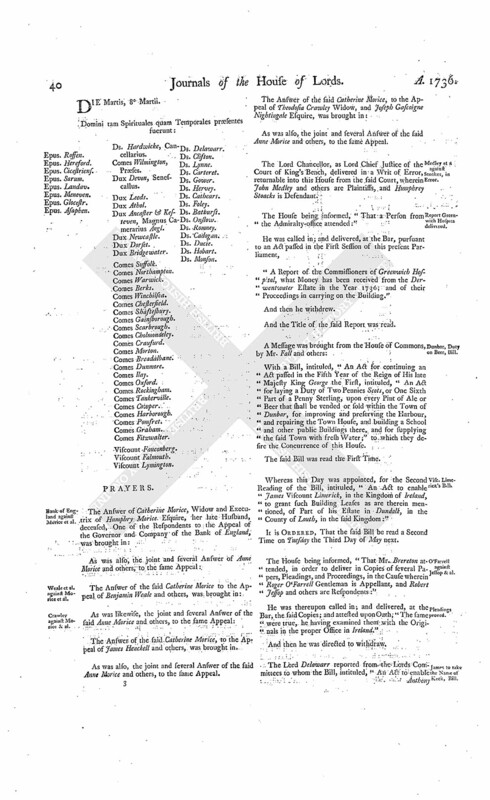 The Papers laid before the House by the Duke of Newcastle, in relation to the Outrage in Scotland, and Murder of Captain Porteous, were also read. And Alexander Wilson the Provost, Thomas Crokat, James Colhoun, Alexander Blackwood, and Gawen Hamilton, the Bailiffs of Edinburgh in the Year 1736, John Lyn Captain of the City Guard, and Major General Moyle Commander in Chief of Majesty's Forces in Scotland, were called in, and sworn. The House was adjourned during Pleasure, and put into a Committee, to take into further Consideration the Speech of the Lords Commissioners appointed by His Majesty for holding this Parliament, made, by His Majesty's Command, to both Houses, the First Day of February last. And the Lord Delawarr reported from the said Committee, "That they had made a Progress in the Matter to them referred." Then it being proposed, "To order, that the House be put into a Committee again, to take the said Speech into further Consideration, on Wednesday next:"
The Question was put, upon the First Proposition. Ordered, That, on Wednesday next, this House shall be put into a Committee, to take into further Consideration the aforementioned Speech; and the Lords to be summoned. To acquaint them, "That, this House having under their Examination Matters relating to the Murder of Captain John Porteous in Scotland, their Lordships do desire they will give Leave, that Lieutenant General Wade and Patrick Lindsay Esquire, Members of their House, may attend this House, touching the said Examination, when desired." And a Message was sent to the House of Commons, accordingly. Ordered, That Major Poole do attend this House on Wednesday next. Dominus Cancellarius declaravit præsens Parliamentum continuandum esse usque ad et in diem Veneris, undecimum diem instantis Martii, hora undecima Auroræ, Dominis sic decernentibus.